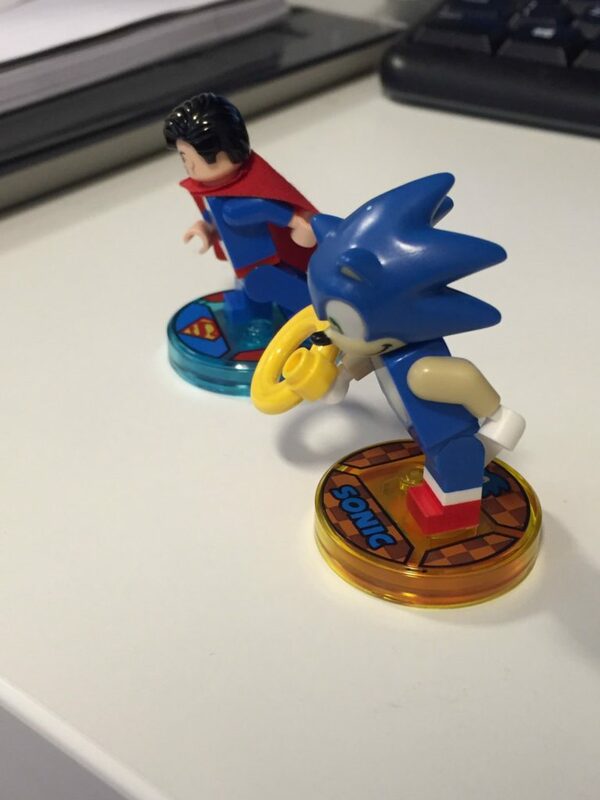 Lego Dimensions producer Mark Warburton posted a number of images on twitter (and then removed them), showing what the actual Sonic figure in Lego Dimensions looks like. Not an amazing look at the figure I’m sure you’ll agree, but needless to say, that’s Sonic, in Lego! Here’s hoping we get a full reveal soon. wow its kinda like his amiibo form. So far the figure looks really good. My only nitpick it the ring. They should have made it without that Lego piece so that Sonic could still hold it but it looks closer to the games.. Hopefully they fix that and if not oh well. Still excited, this has been a dream of mine since I was little. The figure looks awesome! I just can’t wait to see some gameplay of it! Also, I love the Green Hill stand he has. I wish that they just made the ring without the dumb Lego spot on it. What the hell happen to his arms? They’re bigger than Super Man’s! And really… they couldn’t just put the ring in the hand, they had to add a tacky lego to connect the hand to the ring? Sorry but this design choice could have been better. Why are his arms bigger? Because he’s closer to the camera. It’s perspective. Nah his arms are definetely more thick. Sonic been going to the gym lately. No. Superman’s arms are partly obstructed by his cape. Take a closer look. A) No. Those are normal size Minifig arms. It’s the perspective. B) I’ll have to agree with you on that; they do have a ring piece they use with the Lord of the Rings sets – they very ring they used in the reveal trailer – that would have been just fine. The piece is still in print, so I don’t get why. I don’t know why they gave him a yellow lifesaver brick, but it’s not too garish; maybe it was picked because it was more in scale? The lack of strip on the shoe is really disappointing Lego really has a thing against paints apps on that area we’re lucky he even has the socks. It seems like they went with that ugly peg piece on the ring to avoid stressing the plastic on the hand when putting the ring in it. Also interesting that the head greatly resembles the model in Runners and the Nendoroid figure. What I find interesting is how his legs are dual-molded – the top half is blue and the bottom half is white. The red is painted on to form the shoes over the socks. While I would have liked it if they printed the stripe on, when you consider that this set uses a unique head mold and some expensive molding procedures, it’s the best they could do in a reasonable budget. I bet 500 rings to the new guy! When I saw this post at the top of the page I made an inhuman sound. My dream of Sonic in the Mystery Machine fighting alongside Marty McFly, the Wicked Witch of the West, and Homer Simpson against an army of Daleks will be finally realized. Thank you Lego Dimensions for being the first crossover to ever surpass Smash Brothers in terms of ridiculousness. Also, can someone link me to the other images? Sonic looks great, but that golden ring in his hand… not so much! Lego Dimensions Sonic Figure I’m seeing this image is decent looks better than Super Smash Bros 4 Sonic amiibo Figure in my opinion! Sonic isn’t a characters that translates well to the minifig style, but they did the best they could with him and I like the results. Why hasn’t anybody pointed this out yet, sonic stomach is white instead of tan. Lego also need to fixed the arm size an the two different color arm and mouth. One more thing, put the ring in his palm not on top of it. The stomach’s not white, it just looks like that because of the lighting. The arms look thicker because Superman’s are partially obscured by the cape. The ring, though, I agree with you on. The LEGO Piece on the Ring is actually meant to accomodate LEGO Minifigures, and to make it easier to hold and remove. If it were normal, then it would be hard to get out of the claw hand. I find it funny you guys are ignoring an entire interview with Aaron Webber that SA3 had when any other time he speaks it’s instantaneously covered here, even if he posts hashtags and such. Is your bias/spite against those fans/that page really so strong you’d blatantly ignore Aaron Webber himself just because of where the interview with him occurred? Feel free to share excuses. I think it’s funny that you’re ignoring the lack of back spikes on his minifigure, that could be added as a 3D-printed part for him. So when are we gonna get a Sonic/Batman crossover?